We’ve got a Bearss lime tree in a large ex-wine barrel. The peak of the crop, in the past, has been during the dead of winter, December through February. But starting this year, somehow the tree started to offer ripe fruit over a wider period. Like, dropping them frequently over the past couple months. While staring at the limes on the counter, slowly getting drier by the day, my brain told me, “Make curd! You won’t regret it.” I added a bit of ginger, since it goes so nicely with lime — and I didn’t want that rhizome sitting in the fridge to develop more mold *ahem*. Update (8 March 2014): Today I omitted ginger and used about 1/4 cup vanilla sugar, as part of the total sugar. Very nice, especially on gingerbread cake! I think having both ginger and vanilla would work as well. In addition, I froze a couple jars. I’ve been hesitant to do this, but several resources describe how it can work. It’s nice to have more than a week or two, so I’ll check to see how good the frozen-then-thawed stuff is in a few months! Similar to the Meyer lemon curd recipe, but adjusted for the limes’ higher acidity. 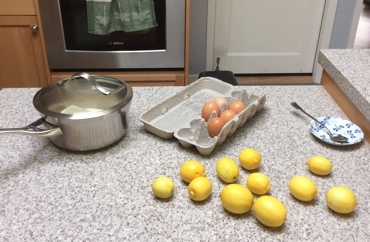 As with the lemon curd recipe, sterilization doesn’t occur, so get your equipment ready. Wash the jars, lids, strainer and large measuring jug, then put them in a 225ºF degree oven for about 30 minutes before starting to cook (which will help dry them off, too). When you’re ready for the next step, turn off the oven so they won’t be too hot to touch when you need them. 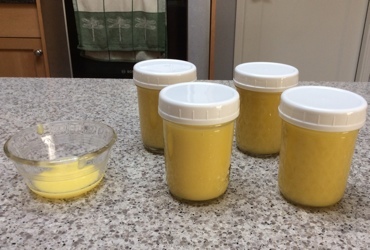 Limes are more stubborn about yielding their juice, so I had a three-step process, done after zesting: (a) roll each lime to soften it; (b) cut in half, hand or tong-squeeze juice into measuring cup; and (c) ream each lime half with a citrus juicer. Because Bearss are seedless, I also added the pulp to the juice. Put all the ingredients in a heavy-bottomed, acid-resistant saucepan. Stir frequently over medium low heat with a whisk. Keep stirring until the mixture thickens into a custardy consistency. You’ll need some patience, as this takes about 10 to 15 minutes, from the time all the butter melts. You want to aim for a custard temperature of 150ºF to 160ºF degrees (65ºC to 71ºC). Then again, once it looks really thick and custardy, take it off the heat as soon as possible. Pour the curd through the strainer into the large jug. Transfer to the jars, then cap them off. Allow to cool at room temperature, then store in the refrigerator. Yields around 3 1/2 cups. This was written by sairuh. Posted on Monday, October 22, 2012, at 11:00 am. Filed under Food. Tagged dips, limes, recipe, spreads. Bookmark the permalink. Follow comments here with the RSS feed. Post a comment or leave a trackback.